It may not seem much, but when you’re away from home in a hospital bed being poked and prodded by medical staff it’s the little home comforts which often bring the most relief to patients. 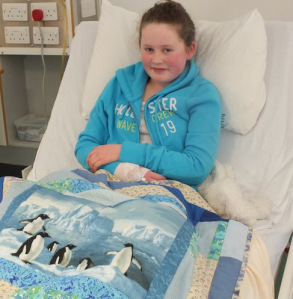 For a young person being given a gift like a quilt to treasure can bring a smile to their face in spite of their pain and discomfort. For the parents of children who spend much of their time unwell, knowing that someone else is thinking of your child can be a comfort and additional source of emotional support. Thank you to our fantastic volunteers who spend many hours sewing, crocheting and quilting to deliver gifts made with love to those in need of some comfort.